A self-taught artist, Dadamaino (born Eduarda Emilia Maino) took up art after completing a medical degree. She exhibited her first abstract works and was awarded the Premio di pittura “Cesare da Sesto”, Sesto Calende, Varese, in 1956. The following year she participated in several group exhibitions including the Mostra nazionale di arti plastiche e figurative, Galleria Il Calderone, Milan, and the Mostra del Piccolo Formato, Ferrara. She also showed for the first time at Piero Manzoni’s Azimuth Gallery, in Milan. In 1958, “Dada” (short for Eduarda) joined Milan’s avant-garde and created her first substantial series of works titled Volumi. 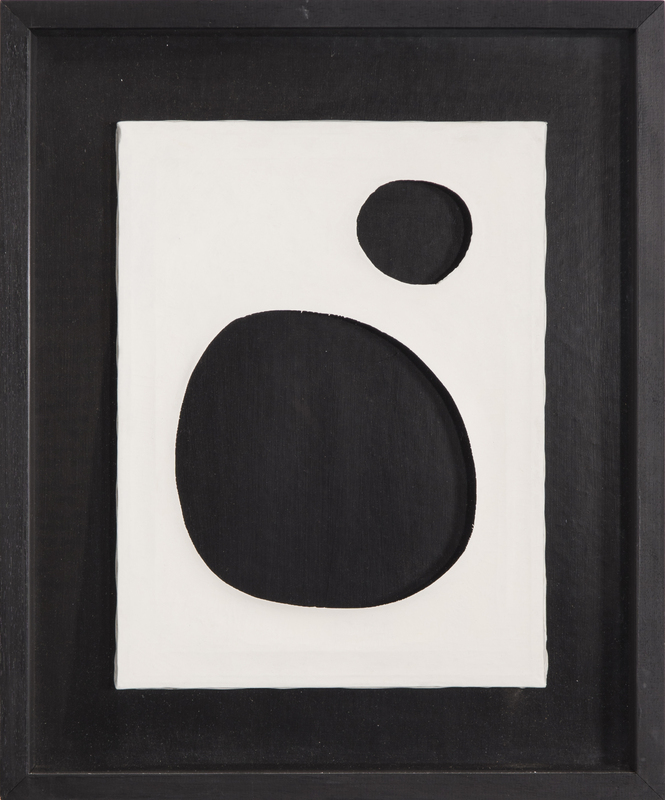 These black and white paintings with large elliptical pierced holes, clearly influenced by Lucio Fontana’s Buchi, allowed the viewer to see vibrant and moving lights and shadows through their orifices. The same year she presented her first solo exhibition at the Galleria dei Bossi and participated in a group exhibition at the Galleria Il Prisma, in Milan. In 1959, she joined the Milan-based experimental group Azimuth, founded by Bonalumi, Castellani and Manzoni, which had connections with Group Zero in Germany, Group Nul in the Netherlands, and Group Motus in France. She participated in a group exhibition at the Azimuth gallery using the name “Maino.” She continued to show her paintings from the Volumi series and presented a solo exhibition at the Galleria Il Prisma, in Milan. The following years she participated in numerous national and international exhibitions in the Netherlands, Belgium, England, Germany, France, Spain, and Switzerland. It was an accident in the Netherlands that her name was misspelled “Dadamaino” and this inspired her to use this as her pseudonym. In 1960 Dadamaino began to work with surfaces pierced with smaller and more numerous holes developing the series Volumi a moduli sfasati made of superimposed hand stretched plastic sheets. In 1961 she presented a solo exhibition at the Studio Gruppo N and participated at the XII Premio Lissone Internazionale per la pittura, Sezione informativo sperimentale giovani pittori italiani. A year later she presented her first solo exhibition in Germany at the Galerie Senatori di Stoccarda and participated in the exhibition NUL at the Stedelijk Museum in Amsterdam, curated by Henk Peeters, that included Italian artists Castellani, Dorazio, Fontana, Lo Savio, and Manzoni. This exhibition gave birth to the international movement “Nuova Tendenza.” Her works at the time were made with aluminum, plastic, Plexiglas, and other materials and had a programmatic nature characterized by pattern and structure. During the first half of the 60s she continued to participate in group exhibitions featuring works by the members of the “Nuova Tendenza,” including Nouvelle Tendance. Propositions visuelles du mouvement international at the Musée des Arts Décoratifs, in Paris (1964). In 1966 she developed the Modular series made of small square cuts that slid along a nylon thread. The elements could be moved creating different combinations. Her intention was to create a transparent effect and to explore the idea of movement without using engines. That same year she began the series Ricerca del colore (1966-68) in which she methodically and scientifically analyzed the infinite color variations of the solar spectrum. The series included 100 plates each measuring 20 x 20 cm containing in total 4,000 color tones and was exhibited at Il gioco degli artisti at the Naviglio Gallery, in Milan. Throughout the 70s Dadamaino created Superficie su superficie (1973), a polychrome constructive work painted in oil and manufactured according to a fixed scheme; L’inconscio razionale (1975), in which the surface traits were distributed on the painting with a non-programmed regularity; and Cromorilievi (1975), made of wooden boards lacquered in black or white. She also produced Alfabeto della mente (1976-1979), a series of “letters” made out of the repetition of alphabetic signs. Inspired by these works she developed I fatti della vita (1978), a series in which alphabetic signs were repeated in regular intervals (sign-pause-sign-pause) exhibited at the Venice Biennial in 1980. In the mid-80s she worked on the series Constellazioni, in which the condensation of the signs, first concentrated and then disintegrated, reminded the viewer of galaxies and star clusters. In another series called Passo dopo passo (1980) she painted different surfaces (paper, cloth and plastic) with repeated symbols to allude to constant movement. In 1983 the Padiglione d’Arte Contemporanea (PAC) of Milan presented a large retrospective of her work. She also participated in Arte Programmata e Cinetica 1953/1963 at the Palazzo Reale in Milan. Throughout the second half of the80s she continued to exhibit her work and to develop new series including Il movimento delle cose, which consisted of drawings on sheets of transparent plastic (polyester) with a special pen. During the next two decades Dadamaino continued to participate in solo and group exhibitions including the Venice Biennial in 1990. She was also featured in retrospective exhibitions at the Museo di Bochum in Germany, in 2000, and at the Museo Virgiliano in Virgil, Italy, in 2003. Arte Programmata e Cinetica 1953/1963 at the Palazzo Reale, Milan, Italy, 1983. Foundation of Concrete Art, Reutlingen, Germany. Lea Vergine, Arte Programmata e Cinetica 1953/1963, l’Ultima Avanguardia, catalogo, Mazzotta, Milano, 1983. Vittoria Coen, Dadamaino, in Minimalia. Da Giacomo Balla a…, a cura di A. Bonito Oliva, catalogo, Bocca Editori, 1998, pp. 60-63. Hans Günter Golinski, Francesco Tedeschi, Vittorio Fagone, Volker W. Feierabend, Francesca Pola, Dadamaino. Retrospektive 1958 -2000, catalogo, Museum Bochum, Bochum, 2000. Luca Massimo Barbero, Dadamaino. L’alfabeto della mente, catalogo, Museo Virgiliano, Virgilio, 2003. Marco Meneguzzo, Stephan Von Wiese, Udo Kultermann, Sylvia Martin, Zero. 1958-1968. Tra Germania e Italia, catalogo, Silvana, Milano, 2004.